The two three-acre sites in Honolulu’s growing Kakaako neighborhood owned by Kamehameha Schools where a developer had planned to build at least one luxury condominium tower likely won’t be developed in this cycle’s real estate boom, but at least one expert tells Pacific Business News that the cancellation of plans to develop the parcels doesn’t mean the current boom cycle is coming to an end. On Friday, Hawaii development firms Kobayashi Group and The MacNaughton Group confirmed to PBN that they were canceling plans to build the Vida 888 Ala Moana luxury high-rise condominium project and develop a neighboring parcel. 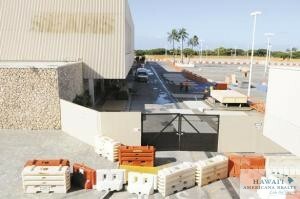 The developers, citing slow sales in recent months for the cancellation of Vida, canceled a contract with landowner Kamehameha Schools to purchase the two lots encompassing about six acres in Kakaako. BJ Kobayashi, co-founder and partner of Kobayashi Group, previously told PBN that plans to develop the block near Vida were also being shelved. The two firms have developed a number of successful high-end projects in recent years, including the Hokua, built during the last cycle, ONE Ala Moana, and Park Lane Ala Moana, which is currently under construction. Price points for Vida ranged from nearly $1 million to $20 million. 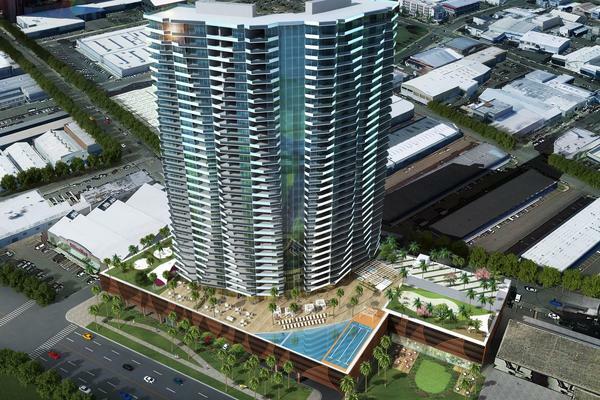 Competition has been tough in the luxury market in Honolulu, especially with Texas-based developer The Howard Hughes Corp. (NYSE: HHC) building two luxury towers in the Kakaako area, with two more planned to replace the Ward Warehouse retail center. San Diego-based developer OliverMcMillan’s Symphony Honolulu luxury condo tower near the Neal S. Blaisdell Center also added to the competition for these types of units. Sales for luxury units moved swiftly just a few years ago, but those days seem to be gone, or at least moving in the direction where demand is no longer that high. Park Lane Ala Moana, the $1 billion luxury condominium project being built by a trio of Honolulu firms — Kobayashi Group, The MacNaughton Group and BlackSand Capital — along with landowner General Growth Properties Inc., is well over 75 percent sold, an executive from one of these firms told PBN. Prices for the project, which was first reported by PBN, range from $1 million to at least $20 million. Park Lane, which started construction in the summer of 2014 at Ala Moana Center’s new Ewa wing, could be completed sometime this year. Located at 1388 Ala Moana Blvd., the seven eight-story buildings will each be 100 feet tall. 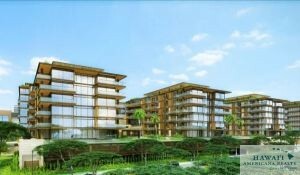 offering a total of 215 units ranging in size from 850 to 6,000 square feet. The complex will also include two floors of residential parking, two-and-a-half floors of commercial parking and amenity spaces, plus one commercial unit. Monthly maintenance fees will be up to $7,500, according to public records. While Park Lane is moving full speed ahead, another luxury condo project by The MacNaughton Group and Kobayashi Group in the Honolulu neighborhood of Kakaako on land owned by Kamehameha Schools called Vida 888 at Ala Moana, isn’t. The developers also won’t be developing the other three-acre site that it had an option to buy from the state’s largest private landowner. The Kobayashi Group and The MacNaughton Group also plan to build another luxury high-rise in Waikiki at the King’s Village site. 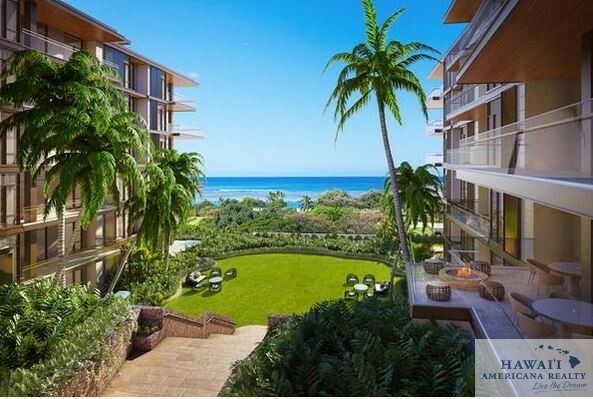 Ian MacNaughton, partner at The MacNaughton Group, told PBN it has been calling buyers at Vida to see if they may be interested in buying at its Waikiki project. Kamehameha Schools has not said what it plans to do with those two three-acre sits that are pegged for luxury high-rise condos as part of its “Our Kakaako” mixed-use neighborhood plan. The Kobayashi Group and The MacNaughton Group have canceled plans to build the Vida at 888 Ala Moana luxury high-rise condominium project and develop a neighboring parcel that would have added a total of 500 residential units to Honolulu’s growing Kakaako neighborhood, citing slow sales in recent months, executives from the two Hawaii developers confirmed to PBN Friday. Construction costs in Hawaii, which jumped by a staggering 13 percent in 2014 — the highest percentage in the United States and more than double the national average. The developers have canceled a contract with landowner Kamehameha Schools to purchase the two lots encompassing about six acres in Kakaako. Kobayashi told PBN that plans to develop the block near Vida are also being shelved. The developers have met with Kamehameha Schools to discuss their decision, and said that the state’s largest private landowner “respects and supports” their decision. PBN reached out to Kamehameha Schools for comment Friday afternoon. 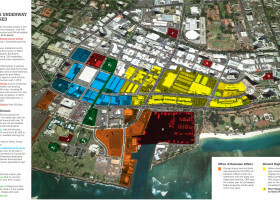 The developers noted that despite strong marketing efforts, community outreach and education about the up-and-coming Kakaako community, the market feedback indicated that it was premature to proceed with the Vida project at this time. 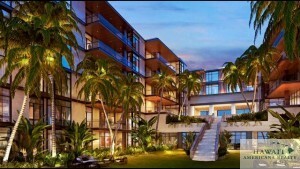 Lines are forming for prospective buyers interested in a new luxury Kakaako development. 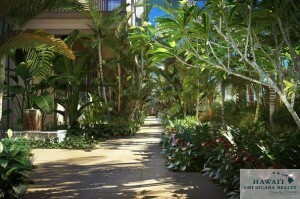 It’s called “Park Lane Ala Moana” and it’s a contrast to towering high rises surrounding the shopping center. Park Lane Ala Moana stands out in a sea of highrises. Park Lane’s seven, six story buildings feature 215 luxury residences, ranging from 850 square foot one bedrooms to 6-thousand square feet 5 bedroom penthouses. All feature Hawaiian style indoor outdoor living. 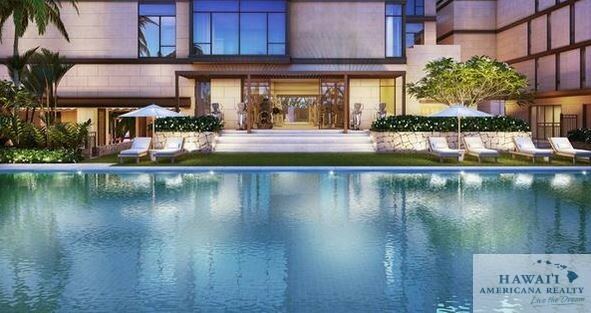 There are 90 plus different layouts, with asking price from 1.1 million to 28 million for the 5-bedroom penthouse. Tomorrow 107 residences go on the market for owner occupants. Unrestricted sales started in November– with a surprising buying trend. The first residents will move in late next year. 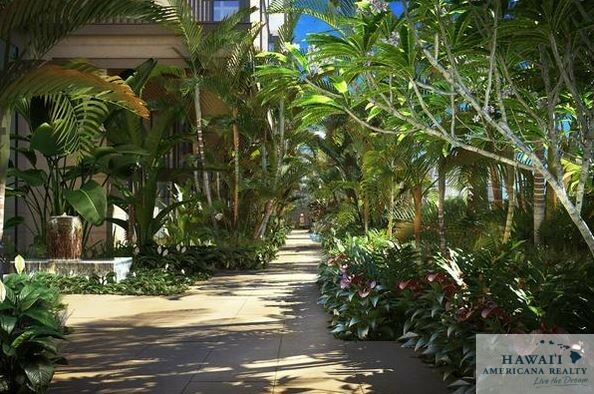 Sales begin Saturday for 107 owner-occupied units at the Park Ala Moana, a luxury condominium complex being built in front of Honolulu’s Ala Moana Center, with prices starting at $1.2 million for a one-bedroom unit up to $28 million for a five-bedroom penthouse. The developer of the project, AMX Partners — which is comprised of Hawaii developers The MacNaughton Group, Kobayashi Group and BlackSand Capital and mall owner General Growth Properties (NYSE: GGP) — opened a sales office on Friday at the nearby Hokua condominium, which was also developed by The MacNaughton Group and the Kobayashi Group. The project, seven six-story buildings fronting Ala Moana Boulevard, is being built next to the new Bloomingdale’s department store under construction as part of GGP’s $537 million redevelopment of the mall’s Ewa Wing. The Park Lane Ala Moana project will eventually have 215 units and is scheduled to be finished by 2017. The latest piece of a master-planned community of residential towers by Kamehameha Schools in Kakaako has been fleshed out with details that include a putting green, guest suites and unit prices projected to start at $900,000. Detailed plans for the condominium tower named Vida were shared with the Ala Moana/Kakaako Neighborhood Board Tuesday night after an initial rough outline presented to the board last month. 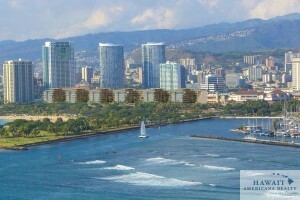 The 38-story tower with about 265 two-and three-bedroom units is proposed by local development firms Kobayashi Group and The MacNaughton Group on 3.4 acres owned by Kamehameha Schools and occupied by a family of Cutter automobile dealerships bordered by Ala Moana Boulevard, Koula Street and a closed-off portion of Auahi Street. Vida unit prices are preliminary, but the developers project a range roughly from $900,000 to $4.7 million for units with about 1,500 square feet to 1,890 square feet of living space. Duncan MacNaughton, chairman of the MacNaughton Group, said in a statement that Vida will be an “understated, yet superb” residential tower. Planned tower amenities include guest suites, movie rooms, dining areas with a professional kitchen, children play areas, game rooms, a putting green and storage for bikes and surfboards. Shops and restaurants also are planned for commercial spaces fronting the street. Two architecture firms, Los Angeles-based Arquitectonica and Honolulu-based Benjamin Woo Architects, produced the tower design. “We’ve built a reputation on our uncompromising standards of quality, and Vida at 888 Ala Moana will set another benchmark of excellence for future residential communities in Hawaii,” MacNaughton said. MacNaughton Group and Kobayashi Group previously partnered to develop three Honolulu condo towers — Hokua in Kakaako, Capitol Place downtown and ONEAla Moana at Ala Moana Center. The first two were completed in 2006 and 2008, respectively, and ONEAla Moana is sold out and under construction. Sales for Vida units are anticipated to begin later this year through Heyer & Associates LLC. The neighborhood board voted unanimously to support the project. The developers will need to obtain a permit from the Hawaii Community Development Authority, which regulates building in Kakaako, but will not seek to deviate from any HCDArules, according to project representatives. Two public hearings will be part of the HCDApermit process. The hearings are expected to be held later this year but have yet to be scheduled. Vida is part of a Kamehameha Schools master plan called Our Kaka‘ako, which generally allows up to seven towers with 2,750 units within nine contiguous blocks. 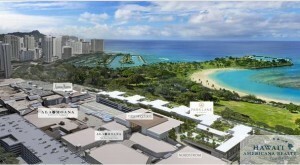 Previously approved pieces of the master plan include midrise rental apartments called Six Eighty Ala Moana, a retail complex dubbed SALT, a condo tower and midrise complex called The Collection, another tower and midrise complex called Keauhou Lane and a midrise condo and apartment complex dubbed 400 and 440 Keawe. Six Eighty was converted from an old office building and completed in 2012. SALTis under construction. The Collection is close to two-thirds sold out and projected to start construction by the end of the year. The Keauhou and Keawe projects were approved respectively in May and earlier this month. A proposed luxury condominium tower in Kakaako called Vida at 888 Ala Moana had to bedesigned to avoid a Native Hawaiian burial site, but the project doesn’t appear to be facing any significant challenges following a public hearing Wednesday. MKVida LLC, a partnership between local development firms Kobayashi Group and The MacNaughton Group, is proposing the 39-story tower with 265 units projected to sell for $900,000 to $4.7 million. On Wednesday, project representatives presented details of the plan to the board of the Hawaii Community Development Authority, the state agency regulating development in Kakaako. The agency, which is considering a development permit for Vida, received public testimony heavily in favor of the planned tower, which the developer said conforms to all HCDA development rules. One potential issue was historic human burials, or iwi kupuna, that are not uncommon in Kakaako where much of the land long ago was sandy and closer to the sea before land reclamation changes. The Vida site is on the mauka side of Ala Moana Boulevard bordering Koula Street and a closed-off portion of Auahi Street — 3.4 acres owned by Kamehameha Schools and occupied by Cutter automobile dealerships. An archeological survey discovered 10 burials in one area on the makai/Diamond Head corner of the parcel. The developer designed the tower away from this area, which would become 19,000 square feet of landscaped open space including a protected area over the graves. The Oahu Island Burial Council approved the preservation plan Wednesday after considering input from recognized cultural descendents of iwi in Kakaako. The State Historic Preservation Division of the Department of Land and Natural Resources also is expected to weigh in on the preservation plan, though that does not prevent the HCDA from deciding on the development permit at a hearing scheduled for Nov. 25 at noon. The HCDA received testimony overwhelmingly in support of Vida, including an endorsement from the Ala Moana/Kakaako Neighborhood Board. The agency received 87 written expressions of support, including a significant number from individuals tied to the construction industry or the project. About half of the letters were form letters from individuals and business owners including principals of Roberts Hawaii and the Panya restaurant chain. Six people also testified in person Wednesday to support Vida. Gerald Kim, an orthodontist who lives in the Pacifica Honolulu condo tower in Kakaako and said he has no financial connections to the developer or Kamehameha Schools, said in written testimony that Vida will produce new homes needed on Oahu. “I strongly feel that the Vida project will help to alleviate the growing housing shortage and allow local professionals such as myself the opportunity to live near the business center of our island,”he said. Sarah Sarkis, a transplant from the suburbs of Boston who reluctantly moved into the downtown Honolulu condo tower Capitol Place four years ago after seeing how expensive single-family houses are on Oahu, said in written testimony that she grew to like high-rise living and wants to live in the planned Vida tower. “Kakaako is an ideal location to expand and connect the already established neighborhoods of Ala Moana and Ward area,”she said. The HCDA received written testimony from 11 individuals opposed to Vida, and one person expressed concerns in person. A few opponents criticized HCDAfor advancing the date for voting on the project’s permit application to Nov. 25 from Dec. 17, arguing that the shorter timetable curtails the opportunity for community input. “Ioppose rushing this project,” wrote Connie Smyth, a resident in another Kakaako tower, Imperial Plaza. MKVida asked the HCDA to move up the hearing date over uncertainty whether Gov.-elect David Ige, who takes office Dec. 1, would be able to appoint four new HCDA board members in time to attend the previously scheduled Dec. 17 meeting. Under HCDA rules, four state department directors automatically sit on the HCDA’s board or designate a representative for the seat. Christian Chambers, an attorney for MKVida, said in the request filed last month that it would be better if board members who vote on the project are the same ones who receive the testimony from developer representatives and the public. Chambers also said the public has had ample opportunity to comment on the project because the permit application with details has been on the HCDA’s website for several weeks. If no hearing were held Dec. 17 because of no board quorum, the HCDA would have been under pressure to vote on the Vida permit by Jan. 19 or have it approved automatically because of a deadline in agency rules. Wayne Takamine, an Ige supporter who said he believes HCDA has not been transparent in some past decisions, disagrees with the adjusted hearing dates. “I believe the incoming administration should have the final say,”he said in written testimony. Ige has not commented on HCDA’s decision to advance hearing dates for the Vida project and another tower permit at Ward Centers. If the HCDA’s board votes to approve Vida, MKVida plans to execute an agreement to buy the project site from Kamehameha Schools and start construction by March. The old Sears at Ala Moana Center is seen in the early stages of its redevelopment in this file photo. Park Lane Ala Moana, the $1 billion luxury condominium project being built on what was once a parking area at Ala Moana Center by a trio of Honolulu firms — Kobayashi Group, The MacNaughton Group, BlackSand Capital — and landowner General Growth Properties Inc., plans to price the units between at least $1 million and at least $20 million. Up until Thursday, prices had not been revealed for the units, which will be built adjacent to the new Bloomingdale’s department store under construction at the state’s largest shopping mall as part of General Growth Properties’ (NYSE: GGP) $573 million redevelopment of its Ewa wing. Alana Kobayashi Pakkala, partner and executive vice president of Kobayashi Group, and Brett MacNaughton, development associate of The MacNaughton Group, gave an update on the project Thursday at a NAIOP Hawaii Breakfast Forum at the Pacific Club in Honolulu. Pakkala said that the project was years in the making. “Back in 2001, I was sitting in a boardroom and talked about how excited I was about [the] Hokua [condominium, which was developed by Kobayashi Group and The MacNaughton Group] because of its proximity to Ala Moana [Center] and with its unobstructed views [of the ocean], but Duncan [MacNaughton, founding partner and chairman of The MacNaughton Group] brought [the Park Lane project] up and said ‘there’s one better location — at the corner of Piikoi Street and Ala Moana Boulevard,'” she said. Pakkala noted that the developers conducted a design competition to come up with the design for Park Lane, which has 93 different floor plans. Park Lane also has some features that were used at the Big Island’s Kukio Golf and Beach Club resort community, which the Kobayashi Group also helped to develop. “We felt we could take the best practices at Kukio and bring it here,” Pakkala said. For instance, it is using Don Vita at Park Lane, the same landscape architect Kobayashi Group used at Kukio. Pakkala noted that there will be a great lawn area that will be made so that one of the homeowners’ daughters will want to get married there one day. Then there’s the actual Park Lane, which will run through the property and act as the backbone of the community. Honolulu-based Heyer & Associates Inc., is handling sales for the project. Park Lane, which was first reported by PBN, started construction this summer and is expected to be completed in 2016. Located at 1388 Ala Moana Blvd., the seven eight-story buildings, which will each be 100 feet tall and have 215 units that range in size from 850 square feet to 6,000 square feet, also will include two floors of residential parking, 2.5 floors of commercial parking and amenity spaces. It also will include one commercial unit and monthly maintenance fees up to a little more than $7,500, according to public records. The Hawaii Community Development Authority has rescheduled the decision-making public hearings for The Howard Hughes Corp.’s plan to replace Ward Warehouse and the Kobayashi Group and The MacNaughton Group’s Vida luxury condominium high-rise on a 3.5-acre site in the Honolulu neighborhood of Kakaako. The state agency, which oversees the redevelopment of the fast-growing Honolulu neighborhood of Kakaako, originally scheduled the Howard Hughes hearing for Dec. 3, but has moved it to Nov. 25, the day before Thanksgiving. The presentation hearing for the Kobayashi-MacNaughton project, which is scheduled for Nov. 12 at 9:30 a.m. has not changed, but the new date for the decision-making hearing has also been moved to Nov. 25 at noon, from Dec. 17. Both hearings will be held at 461 Cooke St. in the Makai Conference Room. The HCDA already held two public hearings on The Howard Hughes Corp. (NYSE: HHC) project, which includes a total of 236 units in two towers, as well as commercial and recreation space on the site of the current Ward Warehouse. The Howard Hughes Corp. is asking the HCDA for four modifications, including to increase the maximum platform height to 65 feet with an allowance of an additional 15 feet in height for 15 percent of the roof area that will be used for accessory uses. MK Development, a joint venture of the Kobayashi Group and The MacNaughton Group, purchased six acres from Kamehameha Schools for an undisclosed price to develop two ultra-luxury mixed-use residential projects totaling about 500 units along the mauka side of Ala Moana Boulevard. The 38-story Vida tower at 888 Ala Moana Blvd. will include 265 two- and three-bedroom units and will be designed by Los Angeles-based Arquitectonica and Honolulu-based Ben Woo Architects, which will be helping the project seek LEED certification with an energy-efficient design and features. Heyer & Associates LLC will be handling sales of the project.